HAVE YOU BEEN LOOKING FOR A COMPLETE MANICURE SET THAT IS BOTH AFFORDABLE AND HIGH QUALITY? BEAUTY BON® HAS IT ALL AND MORE! What's the easiest way to come across as neat, clean, and professional? It's right at your fingertips. Keep your nails stylish and ready with a quick clip or a nice mani-pedi with Beauty Bon®'s 12 Piece Manicure and Pedicure Set! This beautiful 12 piece set comes in an intricately adorned decorative box with a super easy to open lid, so you don't have to worry about messing up your manicure when you reach for your nail tools! All you have to do is press the convenient button located on the box and it opens very easily. This professional grade manicure set has all the tools you need to make an Instagram-worthy manicure and pedicure. Treat yourself to a home spa day today, complete with a mani-pedi! PORTABLE & LIGHTWEIGHT: The Beauty Bon12 Piece Manicure Set comes with a portable synthetic leather case that is easily opened with a push of a button. It is also very lightweight so you can carry it with you in your bag everyday or pack it with you when you go traveling. 12 PIECE MANICURE SET : Included in this 12 Piece set are nail scissors, tweezers, nail nippers, cuticle nippers, a nail cleaner, a sapphire nail file , a glass nail file, a toe nail clipper , splinter tweezers and a cuticle remover. MADE OF 100% STAINLESS STEEL: These MANICURE SET Cclipping tools are all made with 100% Stainless Steel . This set is strong and built to last. You will get your money's worth with this set and more. 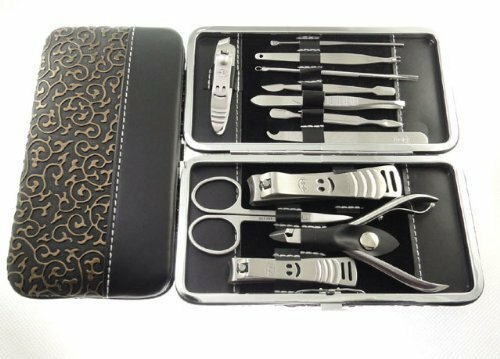 INTRICATELY DESIGNED CASE: The 12 Piece MANICURE SET comes in an intricately designed case that is both stylish and functional. This case is easy to open as well, all that you have to do is press the button and it opens up quickly. Perfect as a gift for men and women! 100% SATISFACTION GUARANTEED: Beauty Bon guarantees that you will love our products. We strive to make only the best beauty applicators,MANICURE SET aids, nail clippers and more--at the most affordable prices for our customers!